This program consists of a session of strengthening, stretching and physical conditioning, a session on trampolines with high repetitions of skills, then onto the dryland diving boards with landing mats for another session of springboard skills. 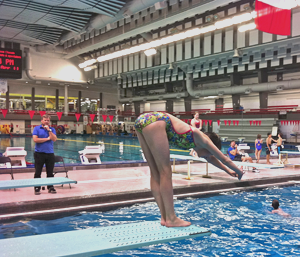 After this the divers have an additional period in the water using diving boards ranging from 0.25 meter, 0.5 meter, 1 meter and 3 meter learning to perfect their acrobatic skills. The internationally acclaimed water softening "Bubble Machine" invented by our Head Coach is available to cushion the impact of any new dive not having a good entry into the water. As well delayed replay video units are available for feed back and analysis. This curriculum and training system has allowed our club to win both Senior and Junior national team championships, place three club members on Canada's Olympic Team, win several dozen national championship gold medals as well as Junior World and Commonwealth Games medals.